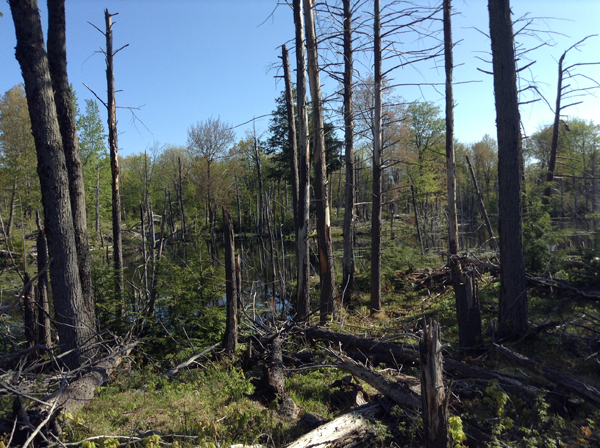 Habitat – Dry, early successional shrubland habitats ranging from pine plantations, dunes, mangroves, barrens, clearcuts and abandoned fields. 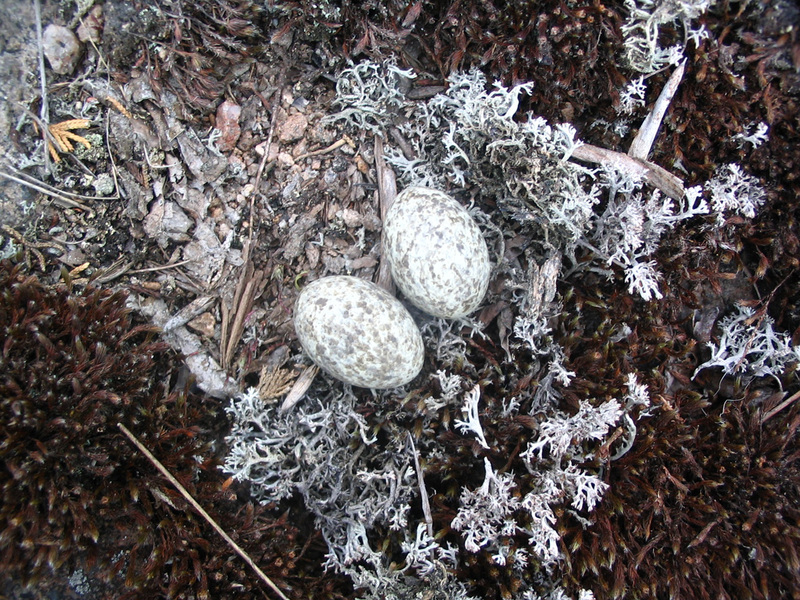 Egg colour – White to greenish white with variable brown spots, usually wreathed at larger end. 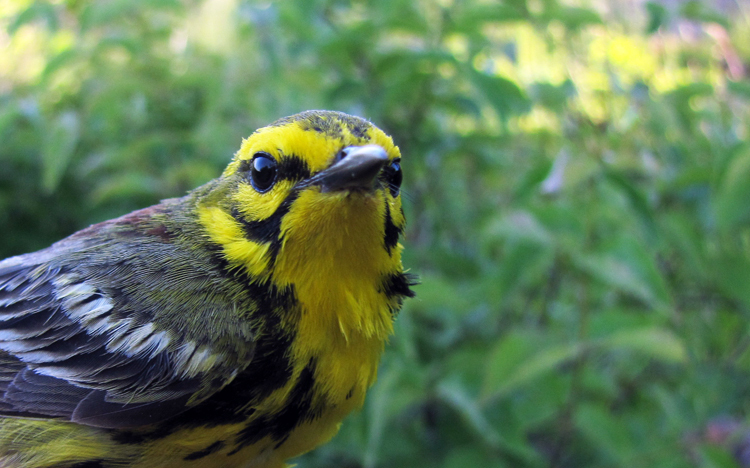 The Prairie Warbler is a rare but regular breeding species in Ontario. 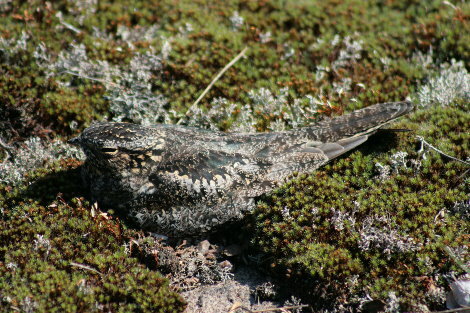 It is estimated that about 300 pairs occur annually in the province, although there is some evidence of recent decline due to habitat succession of granitic rock barrens along the edge of the southern shield region. We’ve been surveying and studying Prairies in Frontenac Provincial Park for the last two years and have found a small but apparently healthy population in open barrens with scattered young trees and pockets of dense shrub cover. The above photo was taken within the core breeding area, which is about 20 hectares in size and characterized by low tree cover, exposed rock, dense ground vegetation and thick patches of vibernum sp. and junipers. 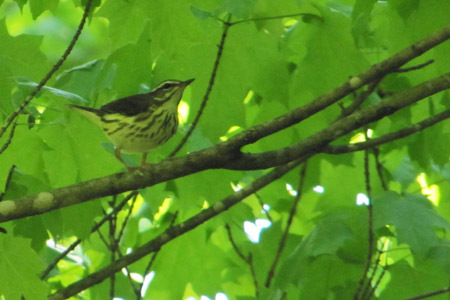 Most Prairie Warbler territories here are associated with sloped shoreline edges of beaver ponds and lakes, which may be a function of denser shrub growth occurring in lower lying areas. This photo shows a typical nest site along a rocky slope where Downy Arrowwood (Viburnum rafinesqueanum) proliferates. Four nests have been found so far this summer and all but one were positioned near the top of a viburnum at heights between .7m-1.3m. 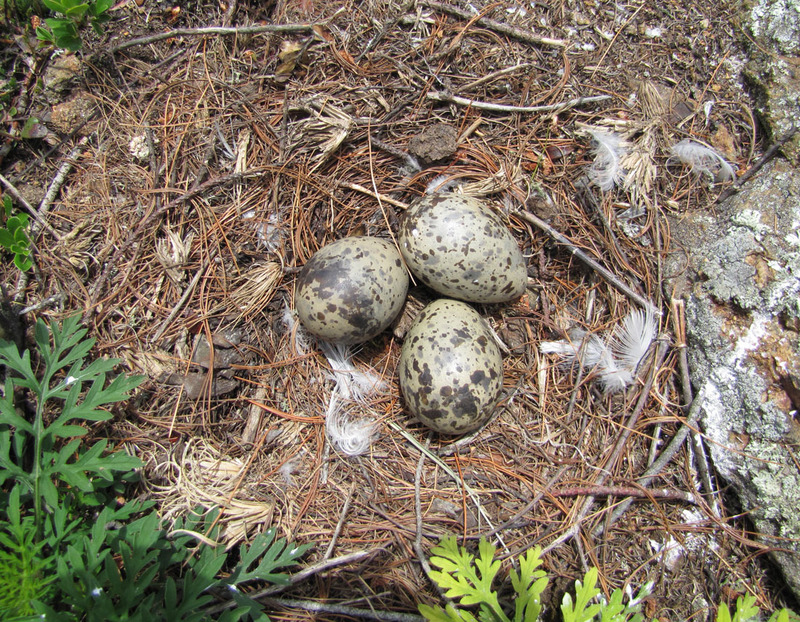 All four nests have been located along slopes ranging from gentle to sharp and with no apparent preference for aspect. Prairie Warbler nests resemble those of the Yellow Warbler (Dendroica petechia), a fairly close relative but less common inhabitant of the rock barrens. 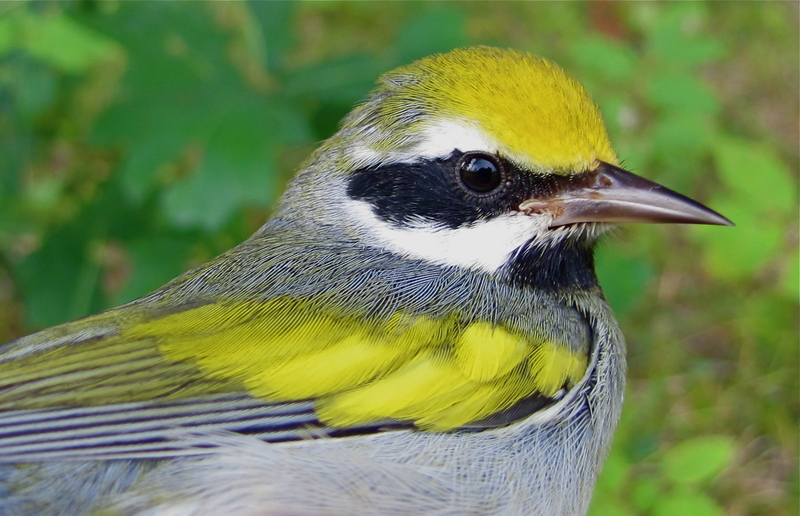 Prairie Warblers favour hot and dry environments while Yellow Warblers tend to occupy wetter shrubland habitats with a more flexible tolerance for shade/canopy closure. 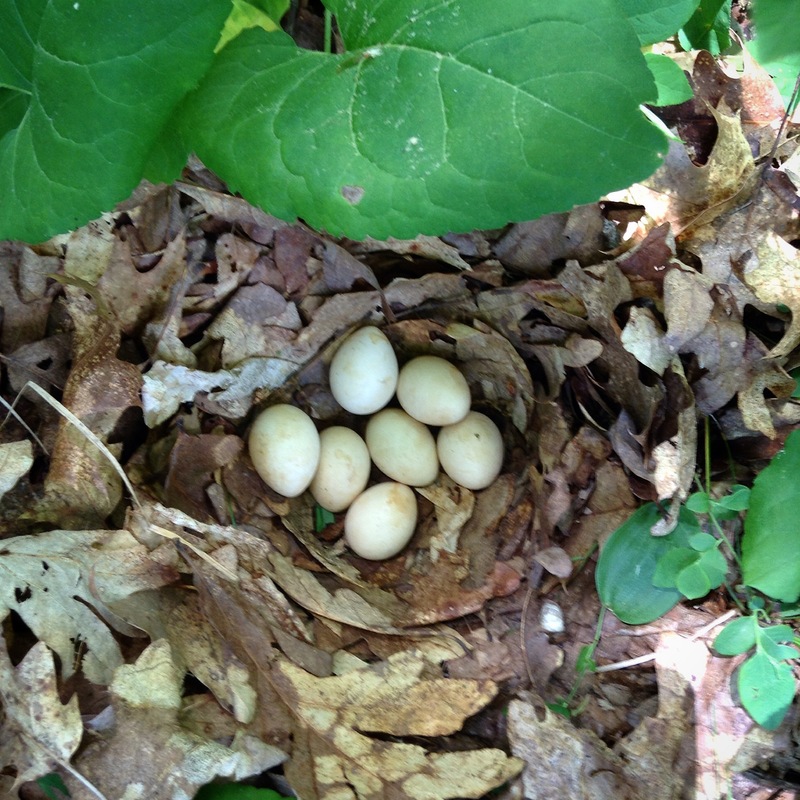 This nest with four eggs was discovered on June 26 when a female was flushed from a small clump of viburnum. 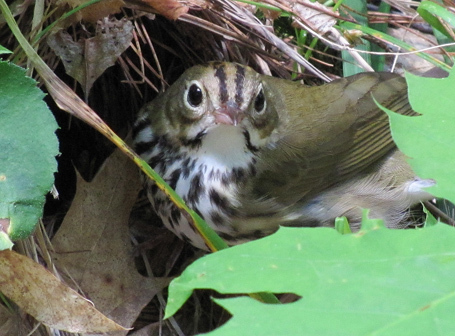 When incubating female Prairie Warblers notoriously sit tight and only flush when very closely approached. 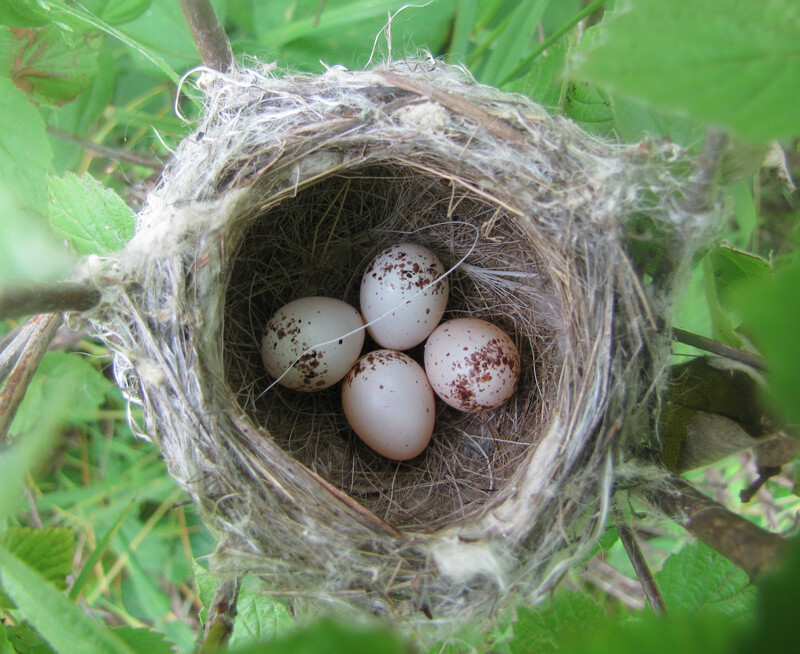 This is a shot of the same nest within the shrub. Prior to nest searching this season I was anticipating that Ground Juniper (Juniperus communis) would be the most common host plant for nests but it seems that the viburnums are more abundant and probably preferred here. They are a stout and sturdy shrub with woody main stems and branches, while the leaf cover provides excellent concealment and weather shielding from all sides. 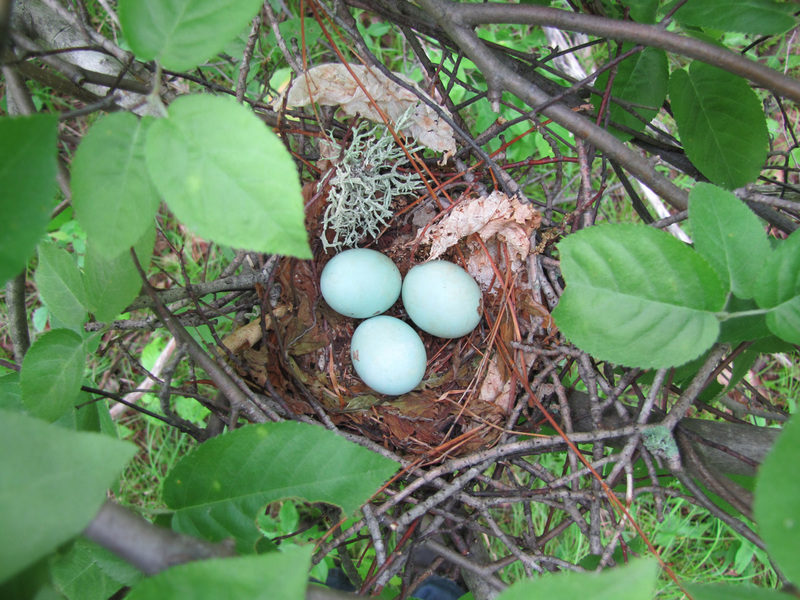 The only non-viburnum nest was located in a lonicera sp. that grew within a large clump of Downy Arrowwood. 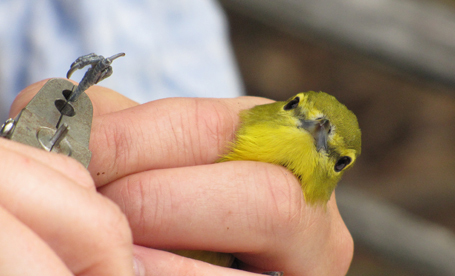 Two of the four nests were found by patiently following adults carrying beakfulls of plump, green caterpillars. One of our colour banded males (nickname “Whitey”) led me to this nest with five young. Thanks are due to Julie Zickefoose for helping Seabrooke and I age these nestlings. These little prairielets were identified as being 5-6 days old and only a few days away from leaving the nest. 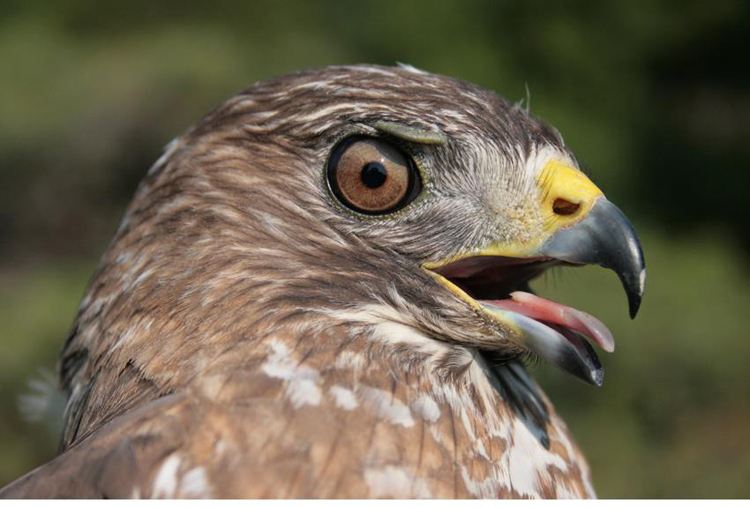 This female was photographed incubating on June 26. 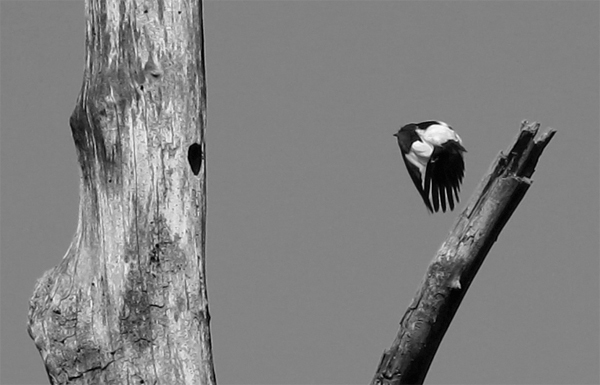 When I returned five days later I was disappointed to find that the nest had failed, probably due to predation. 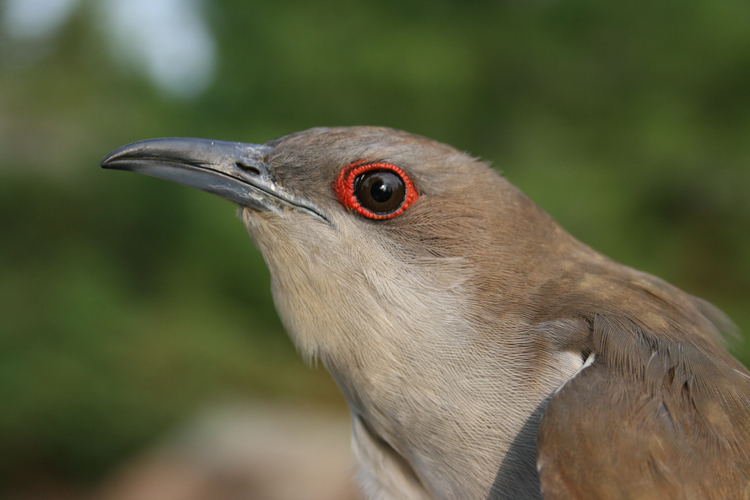 Common Grackles, Blue Jays and snakes would be the most likely nest predators in the barrens. 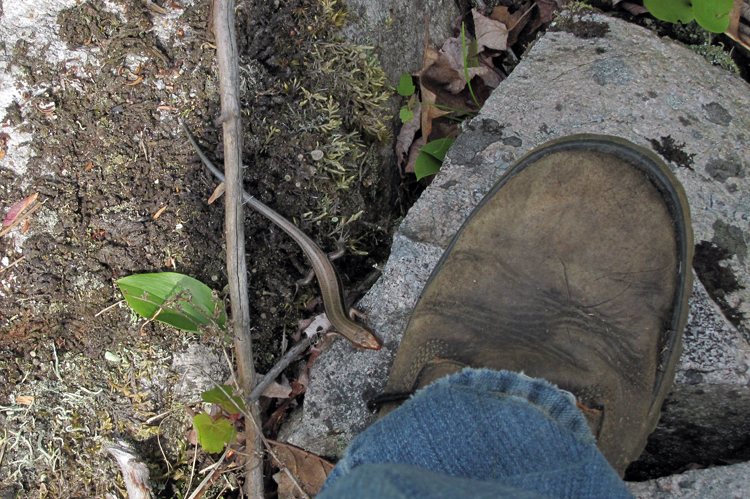 I’ve twice found Ribbon Snakes (Thamnophis sauritus) above the ground within shrubs here. On the upside it appeared that the female, or perhaps a different female, was preparing to rebuild within the territory or perhaps even reuse the failed nest. The attached male (also colour banded) was singing vigorously while the female inspected forks of shrubs and called softly. On two occasions she was observed for five-minute periods shaping and touching up the failed nest. Hopefully the second attempt will fair better than the first! 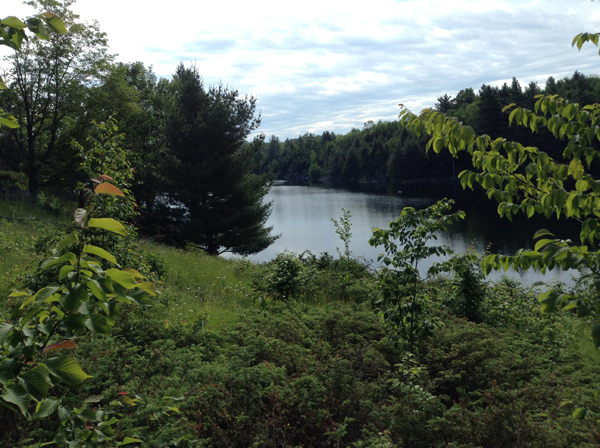 The second annual Frontenac Biothon was held on June 11-12 in various locations at Frontenac Provincial Park. 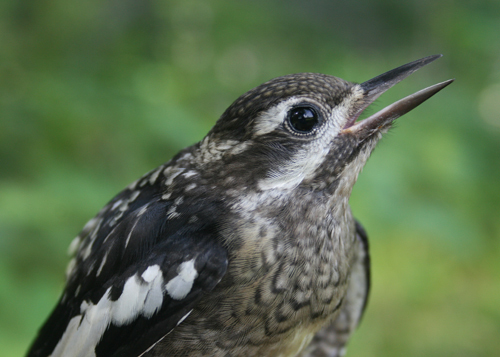 The inaugural biothon in 2010 was a terrific event – full of interesting observations and we raised some much needed funds for Frontenac Bird Studies at the same time. 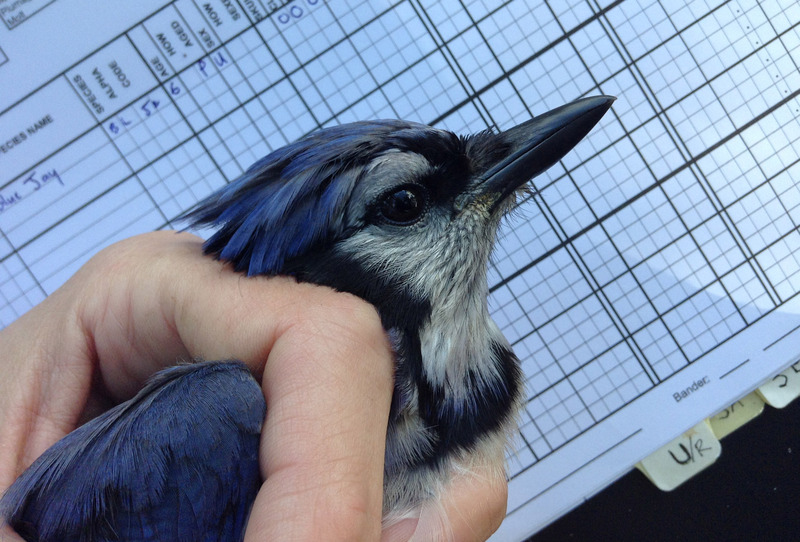 Last year we compiled a total of 441 species, just shy of our target of 500 for the 24-hour blitz. This year we took to the park with a handicap as our plant guru was home with a recently hatched baby girl! We knew we had to step our game up and I’m happy to report that we did just that. The 2011 biothon was a sort of grand tour for three of us. Chris, Steve and yours truly logged over 22 kilometres of hiking in just over 24 hours. 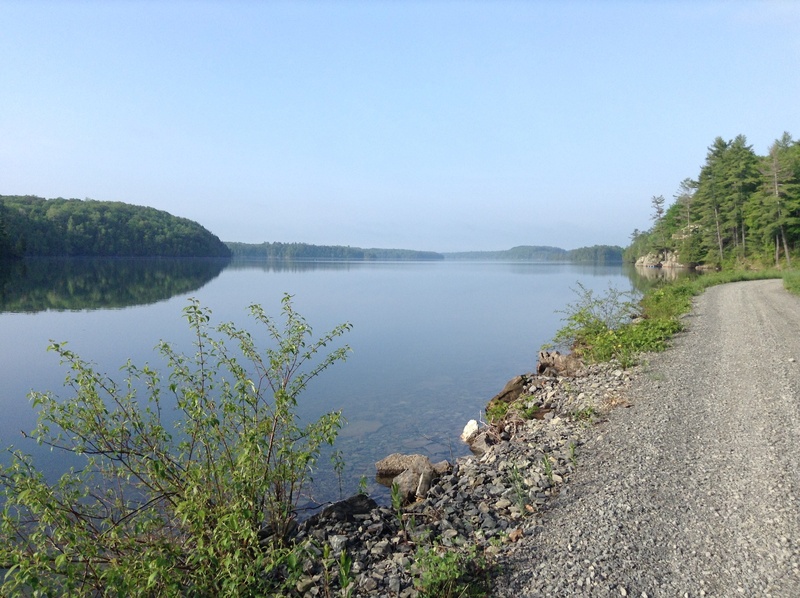 We visited the abandoned farmlands and rock barrens in the park’s southeast corner, traveled some of the park’s main artery along Big Salmon Lake and also biothoned the length of Moulton Gorge, which took us to the mature forests of the park’s northern region. All the effort paid off as we visited some markedly different zones. In the rock barrens we found unique plants and insects, Prairie Warblers, a Sandhill Crane and a singing Yellow-bellied Flycatcher. The crane and the flycatcher were highly unusual summer records for the park! The mature forests were a little more comfortable for hiking due to the shade and cooler temperatures. The diversity here was very high. 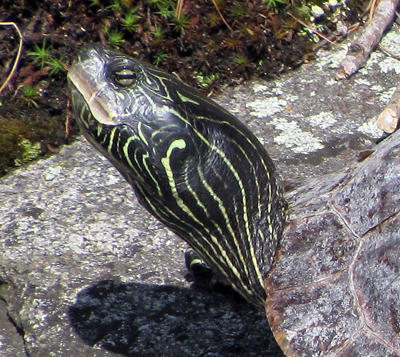 The highlight for me was the Woodland Jumping Mouse that we startled near a waterfall – a fantastic creature. The excursion concluded with the observation of Cerulean Warblers and Louisiana Waterthrushes feeding young – two Species at Risk successfully raising young within 75m of eachother! And finally, actual meadow habitat! Lush wet meadows are very rare in Frontenac Provincial Park as nearly all of the abandoned homesteads and farms have returned to forest. The plant and insect life in these meadows south of Slide Lake was exceptional. It was great to have Chris and Steve there to help me sort through the all the non-avian species. Indigo Buntings and Chestnut-sided Warblers seemed to be most abundant during our stay but I’ll have to return another time for a more thorough search for grassland bird species. Meanwhile, during all of our exhaustive hiking and paddling, Seabrooke was quietly racking up nearly 350 species just at her station near Campsite 6 on Little Salmon Lake! Seabrooke probably considers herself an insect specialist but is a very well-rounded naturalist, too. By the end of the biothon we had recorded 166 species of insects. Dragonflies and butterflies were much more evident this year than last and we still managed to ID a small selection of nocturnal moths despite the wind and rain that moved in during the evening of 11th. Our totals were a little higher for all taxa in 2011 with the exception of moths and fungi/lichens. The lower diversity in both of these groups is due to weather (moths) and event timing (fungi). 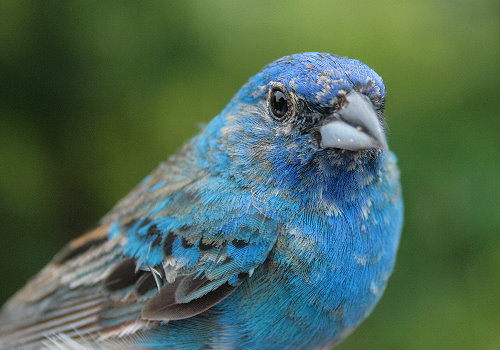 We are still working on a few identifications but at present our total for Frontenac Biothon 2011 stands at 468, which is 27 species higher than last year. While not quite the 500 mark, our list for 2011 was quite an achievement given that we were missing a key team member and that the weather severely limited our mothing production. Much like our biothon from a year ago we found some truly great stuff, had an adventure and supported the FBS program to boot – all things that make the biothon a great event! On behalf of the Migration Research Foundation I wish to extend our thanks to this year’s many sponsors who donated to the three biothon teams. Of course, the whole event would not have been possible without the efforts of our dedicated volunteer biothoners; Chris Dunn, Steve Gillis and Seabrooke Leckie! 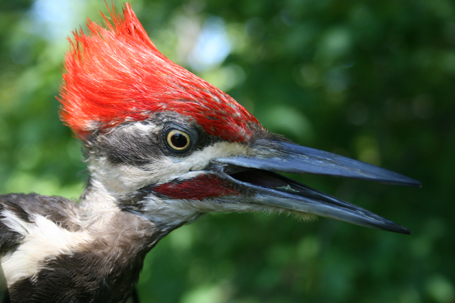 Lastly, thanks to the following Ontario Parks staff for their continued support of Frontenac Bird Studies and the Frontenac Biothon fundraiser; Corina Brdar, Peter Dawson and Bert Korporaal. Below is a small selection of species recorded during this year’s biothon – hope you enjoy! It will have to be another brief update for today. I suspect I won’t be back to more lengthy writings until late June or early July when things begin to ease up – I’m pretty swamped with fieldwork right now. 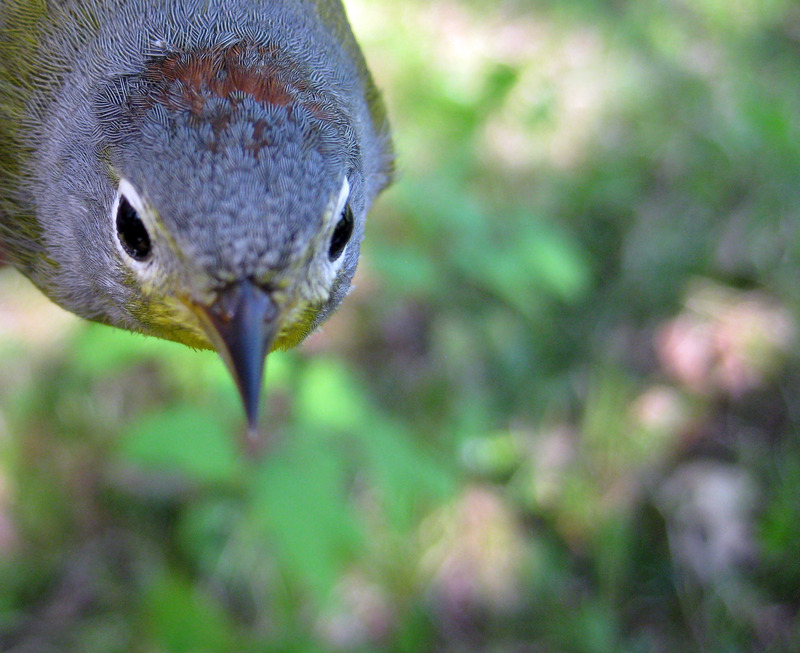 One of the major tasks at hand is our continuing studies of Prairie Warblers in Frontenac Provincial Park. After 13km of combined paddling and hiking I managed to capture and band one of the isolated males this morning! Our fieldwork is well underway in spite of what has been a late arriving and slow moving spring season. The leaf-out is at least a week or two behind schedule and the woods have been unusually quiet for this time of year. 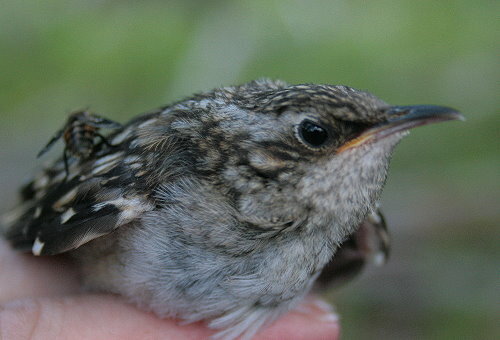 However, migrants and returning breeders are appearing in small numbers. 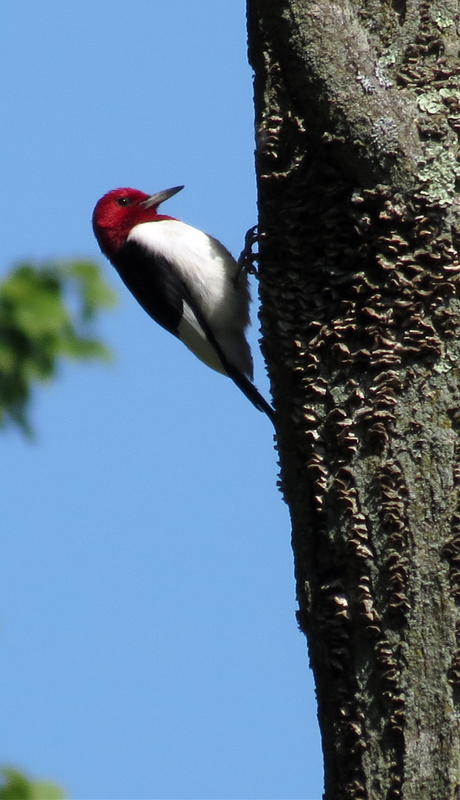 A pleasing variety of neotropicals was observed yesterday, which included Wood Thrush, Great Crested Flycatcher and Cerulean, Black-throated Green and Black-throated Blue Warblers. 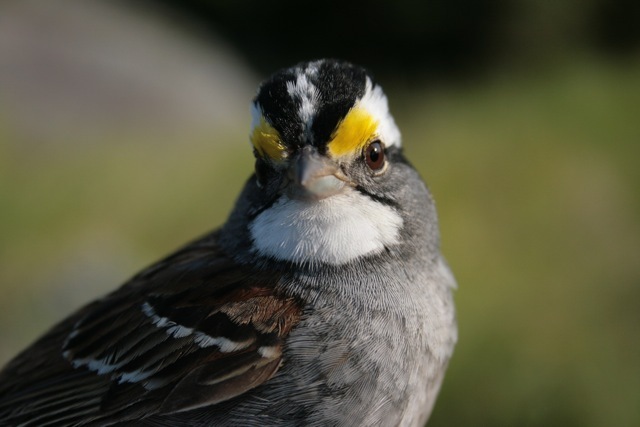 Of particular interest were sightings of Pine Siskin (two occurrences) and Evening Grosbeak – both rare but potentially nesting species in the park. 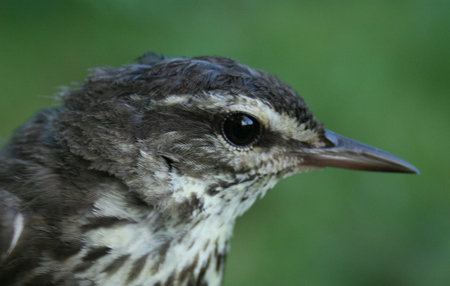 Our official duties at this time of year focus on the Louisiana Waterthrush (Parkesia motacilla), which have been trickling back into Ontario since mid-April. Over the winter a thorough inspection of high resolution aerial photography was conducted, which revealed over 30 potentially suitable nesting sites within our core study area (not including sites visited in 2010). Needless to say I’ve got a ton of walking and canoeing to do in the next few weeks! I will update on our survey results throughout the month of May. In addition to the LOWA reconnaissance we’ve been preparing switch our attention to Prairie Warblers in late May-early June. This year will involve a more extensive ground search of granite barrens in Frontenac Provincial Park for Prairie Warblers. 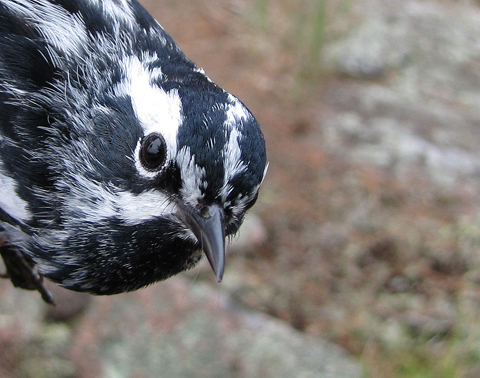 We will also be assessing habitat, nest searching as well as colour banding and tracking males. 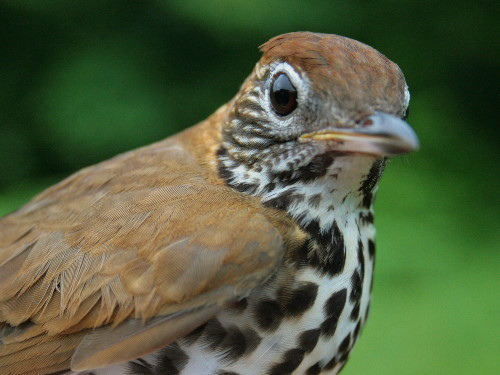 The project represents our first in-depth look at a breeding species in the Frontenac Arch. 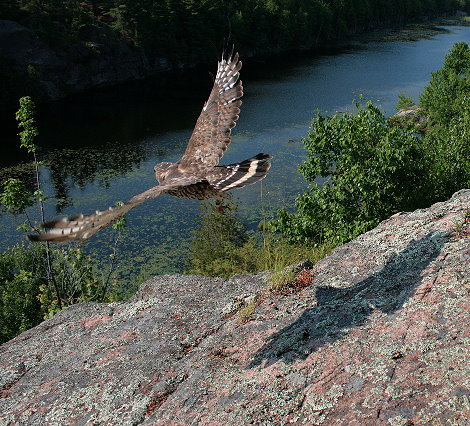 The granite barrens scattered along the southern edge of the Canadian Shield in south-central Ontario have received relatively little attention but are important to several species currently in decline such as Common Nighthawk, Field Sparrow, Eastern Towhee and Prairie Warbler. 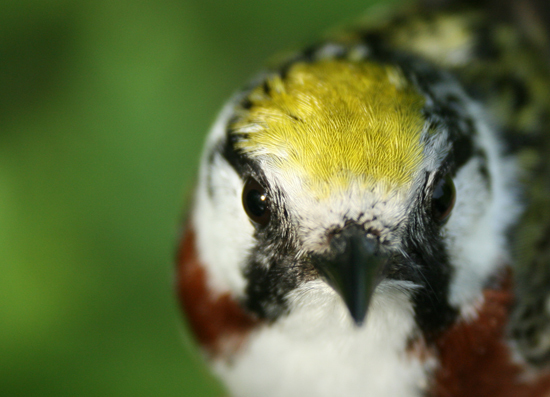 Our inventory of Prairie Warblers in Frontenac Provincial Park is now complete! 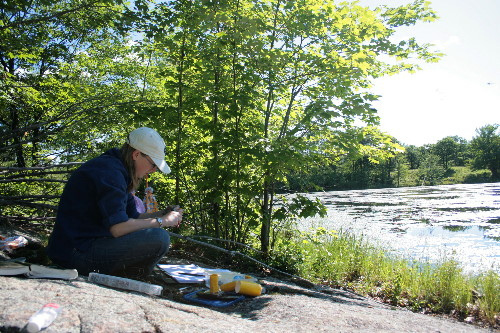 Conducting the inventory required lots of hiking over rugged terrain and canoeing – 41 kilometres in all. The Prairies are occupying rock barren habitats in perhaps the most inaccessible part of the 5000 hectare park. I am relieved to report that it was well worth the effort as a surprisingly large number of Prairies were located. Prior to this season I had hopes that about ten pairs would be found in Frontenac but really had no expectations beyond the few pairs that were first encountered at Slide Lake last summer. The second edition of the Ontario Breeding Bird Atlas provides an excellent summary of the current provincial status of the Prairie Warbler. Incidentally, a bright male Prairie Warbler was chosen as the cover bird for this important work. 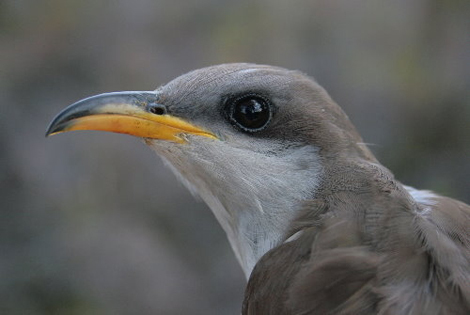 The authors of the account note that the distribution has remained unchanged since the first atlas conducted in the early 1980’s, although many long standing colonies had been deserted due to habitat succession. 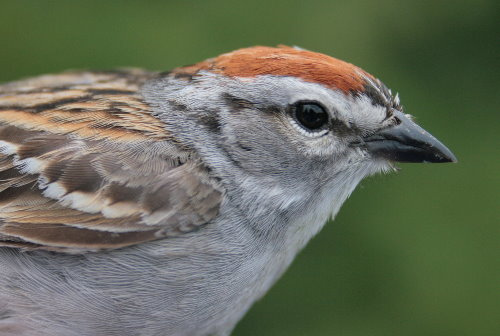 Several colonies in the Frontenac region have disappeared including a large population of perhaps 20 pairs that inhabited the west side of Canoe Lake, which hosted birds from 1961-1987. Another historical colony resided at Devil Lake for more than 40 years from 1948-1988 (Weir 2008). The largest population remaining in Ontario occurs in the Georgian Bay region where 270 pairs were located in the 1990’s (Harris 1998). 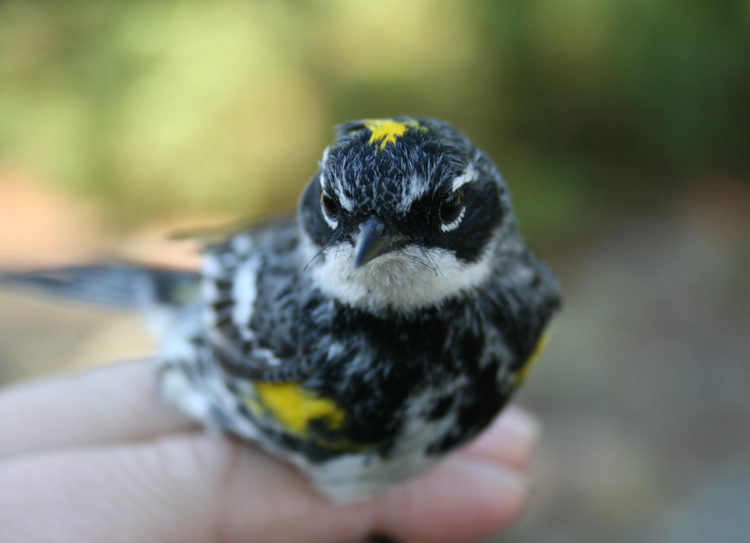 Outside of Georgian Bay, colonies of Prairie Warblers seem to be less concentrated, possibly due to habitat shortage, which could make them more susceptible to extirpation. 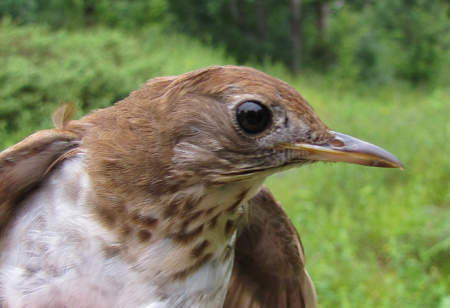 The population in Frontenac Provincial Park, inventoried for the first time this summer, includes a minimum of twenty territorial males! At least four of these males are paired with females. 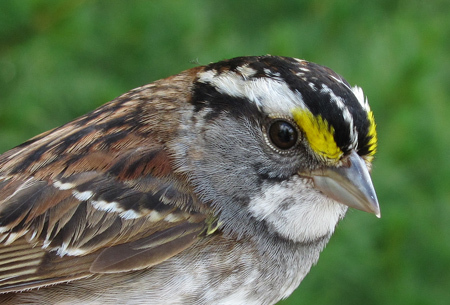 Additional males were likely encountered in two instances involving three males in territorial dispute but it was impossible to exclude potential overlap. 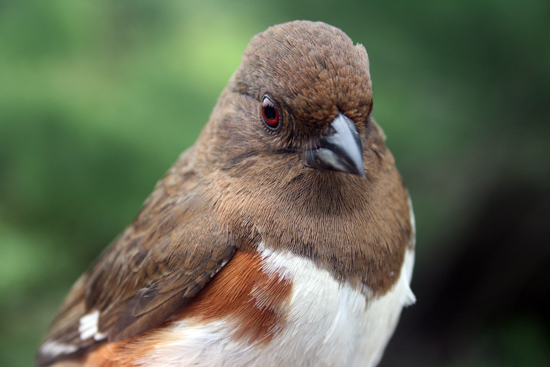 The figure of 20 males is a conservative tally of birds with territories delineated by counter singing. I have yet to perform any analysis of habitat availability versus our coverage but strongly suspect that an upper limit of 30 pairs would be a reasonable estimate for the population. At 20-30 pairs It is quite possible that this population may be the largest known active colony outside of the Georgian Bay region. I spent a lot of time looking for females and managed to find just four over several days of fieldwork in the rock barrens. Females were likely hunkered down on well hidden nests and not moving around much. I did find this female (pictured above) that was much more active. 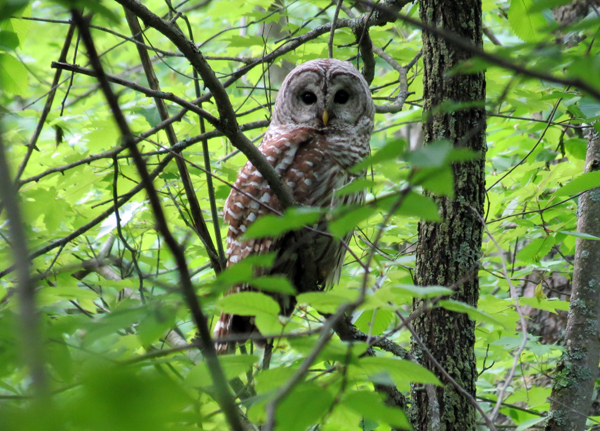 I watched her frequent comings and goings to a patch of dense shrub near an Eastern White Pine. 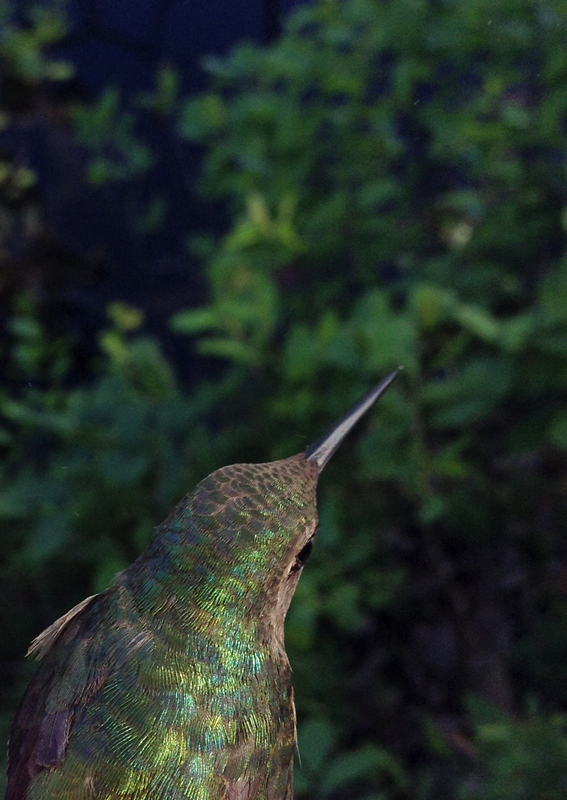 She made half a dozen trips to the patch with beakfulls of “stuff”, either bugs or nest material. I didn’t approach the presumed nest site until the 7th trip when it was clear that food was being carried to the spot (approaching during nest building could have resulted in abandonment). I fully expected to find a nest with young in one of the shrubs but found this instead….. 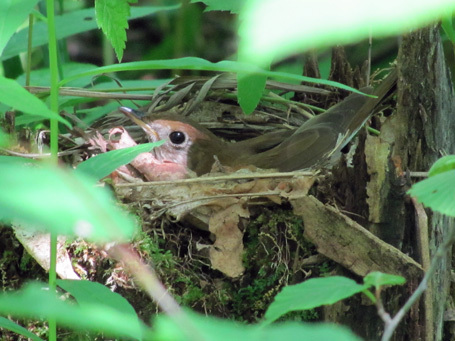 This discovery of fledged young confirms successful breeding in Frontenac Provincial Park for this year and provides some indication that the colony is viable and productive! We now have a much better grasp on the current breeding status, habitat association and population density of Prairie Warbler in the park and can now begin setting more specific targets for future years. More to come in 2011….